In a local library in Rafah, South of the Gaza Strip, children are busy working on a white cardboard. They are creating their cinema’s box office. Others are allocating number stickers to the seats. Another group of children are in charge of distributing popcorn in preparation of a film screening. Children then line up to get their tickets before entering the screening venue; they stay quite as their eyes gaze at the screen; but once the movie ends, they are eager to talk about what they just saw and reflect on their first cinema experience. Some talk, some sing, some dance and some draw. This is only a brief scenario of one of the 160 screenings we have managed to implement across the Gaza Strip in 2017 thanks to your generous donations. Below is an update of some of the major outcomes of the cinema’s Project activities last year. Gaza Children Cinema: The idea was to create a peaceful, creative space where kids could be just kids—a space where a child can live a joyful moments while surviving the bitter reality of siege loss, hardship and war. The result was the Gaza Children’s Cinema, a project was born out of a desire to create a safe haven for children, and it is evidence of the magic of cinema—of how film can relieve suffering and provide light to literally one of the darkest places in the World. The Cinema in 2017: In 2016 and early 2017, we managed to raise 7800 AU$ through our online fundraiser page and through other fundraising events in support of the Gaza Children Cinema project. In April 2017, we partnered with the Tamer Institute for Community Education, Gaza, in order to facilitate the implementation of the cinema screenings and to allow the initiative to be led by the local community, especially young volunteers. This partnership was important for building on the existing community resources in reaching more children. We did not want to re-invent the wheel, no one does want! Besides targeting marginalised areas for the screenings, we have successfully managed to engage libraries and to promote regular screening within library settings across the Gaza Strip. 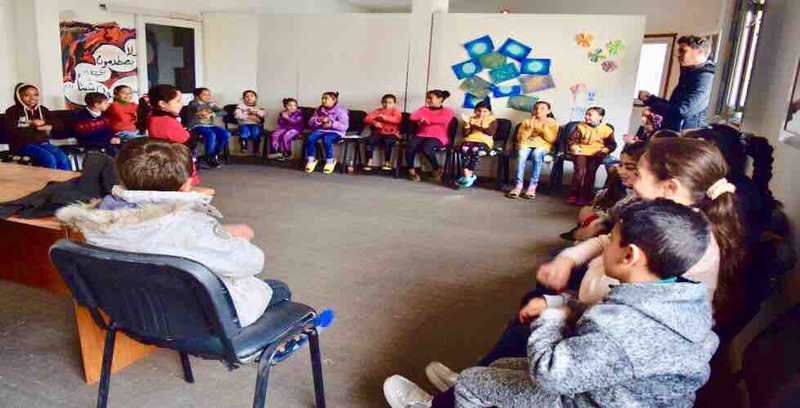 In preparation of the screenings, the Tamer Institute held two training workshops for the librarians and the young volunteers from Tamer Institute. 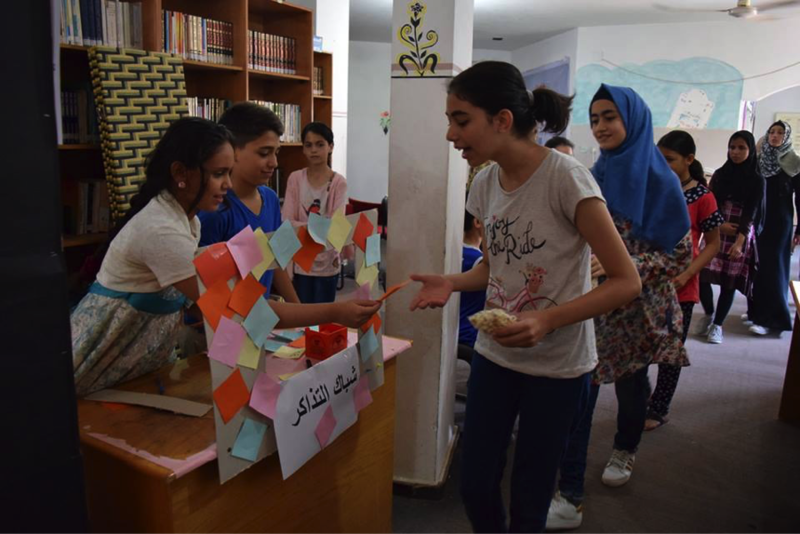 The workshops focused on brainstorming the best ways to make the screening a successful enjoyable experience for the kids, the choice of the films and training the librarians to use arts as a tool of expression for the children to reflect on their inner thoughts and emotions. 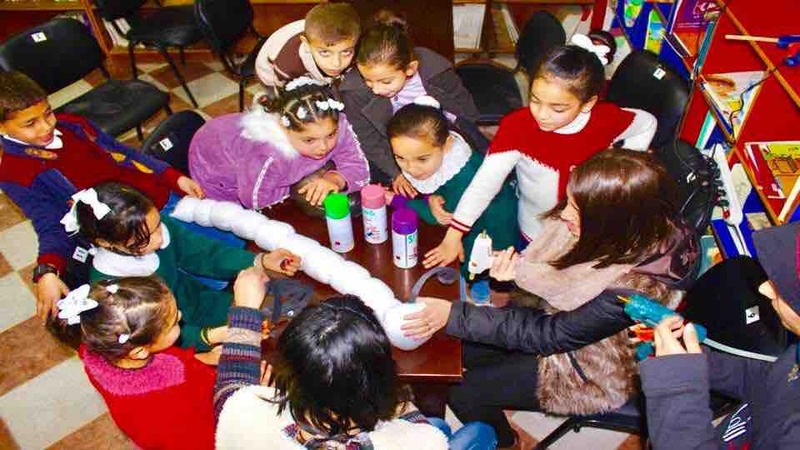 Gaza Children Cinema activities have been carried out across the Gaza Strip including border areas, marginalised children communities and refugee camps. About 160 cinema screenings were held with the children throughout 2017. We have managed to reach out to hundreds of children each month through organizing several screenings at several locations. 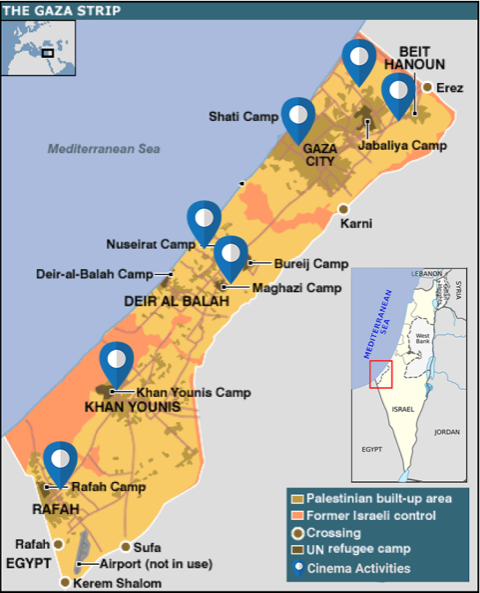 The screenings were held across the Gaza Strip in Gaza, Rafah, Khan Younis, Maghazi Refugee camp, Jabalia refugee camp, amongst many other locations. We have seen children join the cinema sessions with their parents in inclusive and entertaining settings. With the support of Gaza Children Cinema volunteer team, these children had the opportunity to engage into stimulating and interactive discussion prior and after the film screenings. In September, and as part of our attempts to reach the most marginalized children in the most remote areas, we launched a call for proposals for initiatives around cinema and children. To our surprise, we received about twenty proposals from grassroots community groups. This has assured us that the impact of the Gaza Children Cinema is invaluable and is growing. This project has been fully funded by charitable fundraiser events that we have voluntarily carried out. Either through food stall markets, various movie screenings or an online fundraiser page, we have managed to raise enough funds to keep this initiative going and growing. And today we are hoping to raise funds to sustain this project for another year. This is a message of gratitude and appreciation for making this initiative real. Without your generous donations, we wouldn’t be able to reach many of children across the Gaza Strip, and offer them some moments of peace, dialogue, and entertainment. We are determined to continue in this track, this time with more commitment and enthusiasm. A photo of a cinema workshop, where we try to take the student through an imaginative cinema experience. The children here are performing buying their tickets to enter the movie screening. 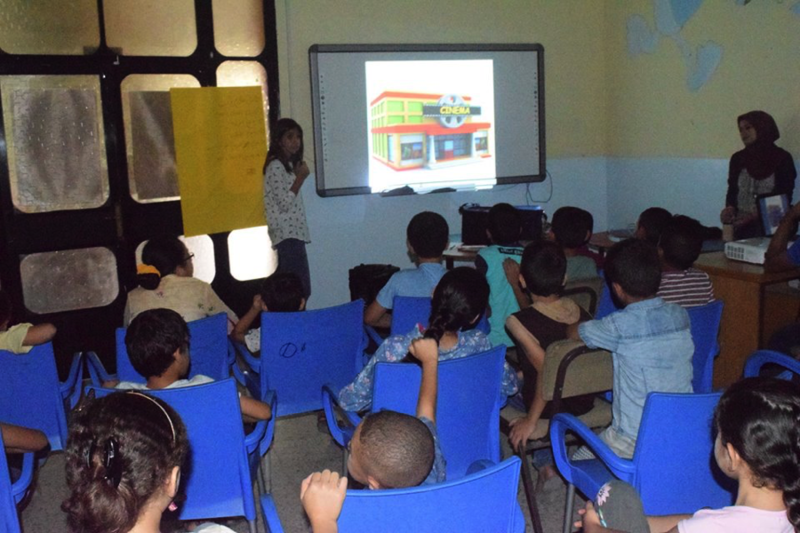 During a cinema workshop with the children aged (12-15) implemented in Atfalona Society for Deaf Children. This picture is for the children while they are standing in a line to take the cinema tickets. “What would a cinema theatre look like? ?” a photo of children in a pre-screening workshop on cinema in Rafah, South of Gaza. The children are watching photos of cinema theatre and imagining what would the cinema look like. Most of these children would have never experienced a real cinema setting. A photo of children creating a movie poster for the movie they are going to watch. This workshop was held in the Red Crescent library in Gaza City. And it shows part of the activities Children engage in before or after each screening. A humanitarian small message of love from West Australian born Academy Award Winner, Shaun Tan, for the Palestinian Children residing in Gaza. In August 2018, Gaza Children Cinema reached out to West Australian born Academy Award Winner, Shaun Tan, to request a small message of love, for the Palestinian Children residing in Gaza. We have been overwhelmed by Shaun’s message of support. 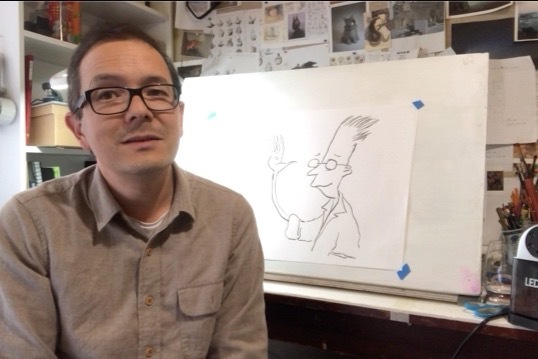 He sent us a beautiful video, in which he shared his story, and tips on art, drawing and life. He also graciously donated a box of books for the children, along with the original art work which he drew during the filming of the video. Almost eight months later, and we are pleased to report that Shaun’s message has reached Gaza! 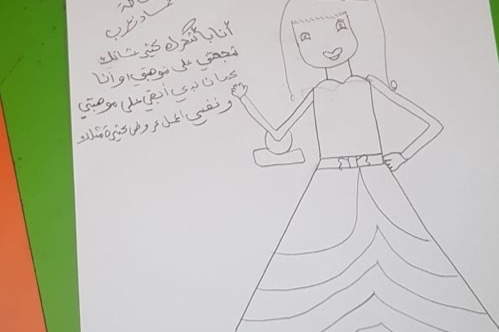 The video, translated into Arabic, premiered last week, along with Shaun’s animated short film ‘The Lost Thing’ at a local community library in Khan Younis, south of the Gaza Strip. 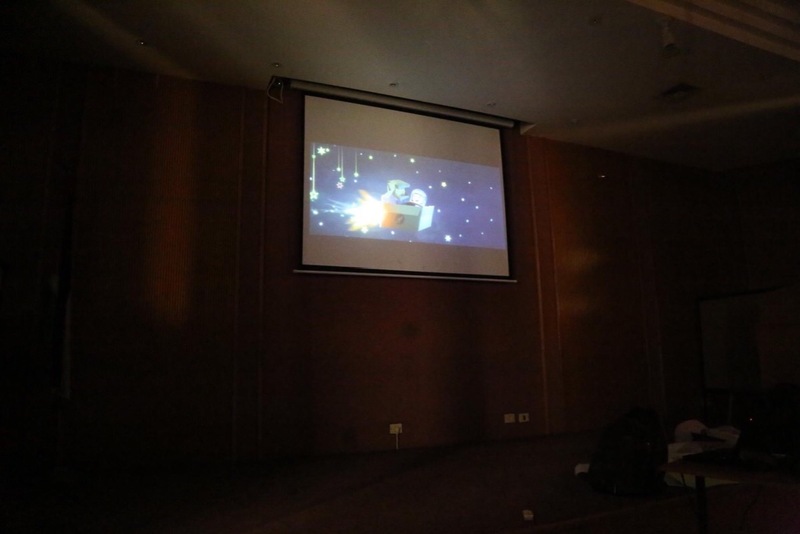 Not many premieres are held in Gaza, so although Gaza Children Cinema has had the footage for a while, a conscious decision was made, that the premiere should be in Gaza. ‘I thank you very much (Shaun Tan) because you have encouraged me to explore my talent and I really want to keep it. My inspiration is to do lots of shows like you’. Over the next year, this movie and video message package will be shown to over 100 groups of children throughout Gaza. Gaza has always been a challenging environment for children, and especially so over the past two weeks, as the city has been under a sustained and brutal onslaught from across the border. In a city with around one million children, where there are no cinemas, little infrastructure, inconsistent water and power, and a military embargo limiting food, medicines and other essentials, not to mention constant military threat, a simple event like watching a movie, can be a vitally therapeutic and impactful event. We invite all the wonderful teachers out there, to contribute to this gesture of love to the children of Gaza, by organising a viewing of Shaun’s amazing message for your class? A simple gold coin donation by participating children would raise valuable funds that will help us reach more children with our work. It is a simple, yet profound act of international peace and solidarity between children. If you would like to be involved in this activity, please reach out to us via Personal Message and we can help with logistics. We offer our sincerest thanks, to the amazing artist and humanitarian Shaun Tan for his support and love, for the children of Gaza. 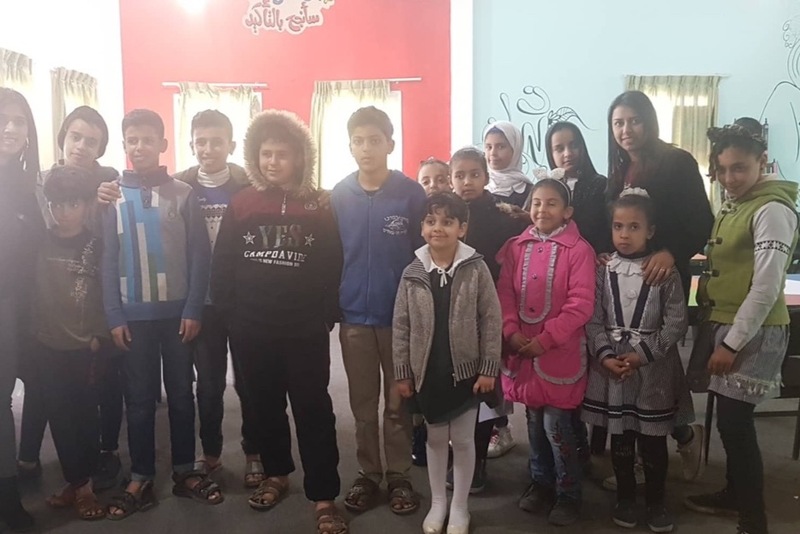 Special thanks to Mais Saqqa, Gaza Children's Cinema’s field coordinator in Gaza and our partner in Gaza Tamer Institute for Community Education for continuing to reaching out to children in Palestine providing spaces of hope and learning. 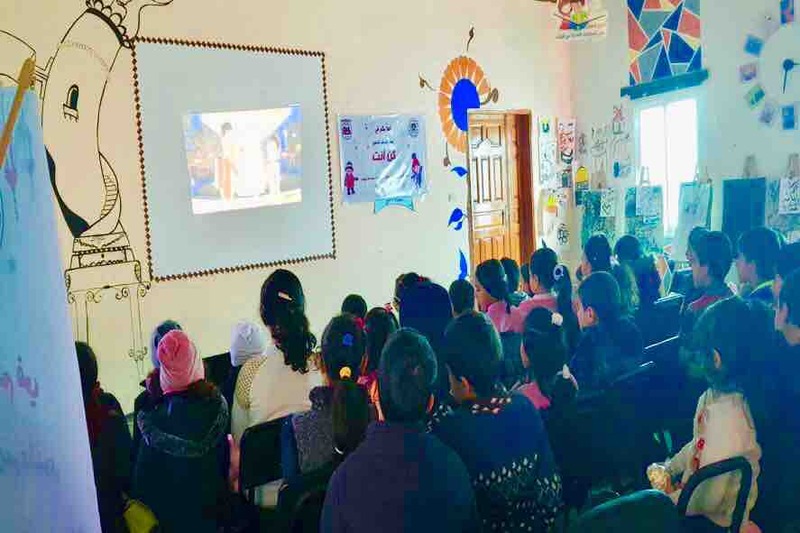 In quest of creation child-friendly spaces, Gaza Children's Cinema and in support of our partner Tamer Institute for Community Education , our team has organised 22 interactive movie workshops targeting children and their families in local community libraries across the Gaza during the month of Feb 2019. 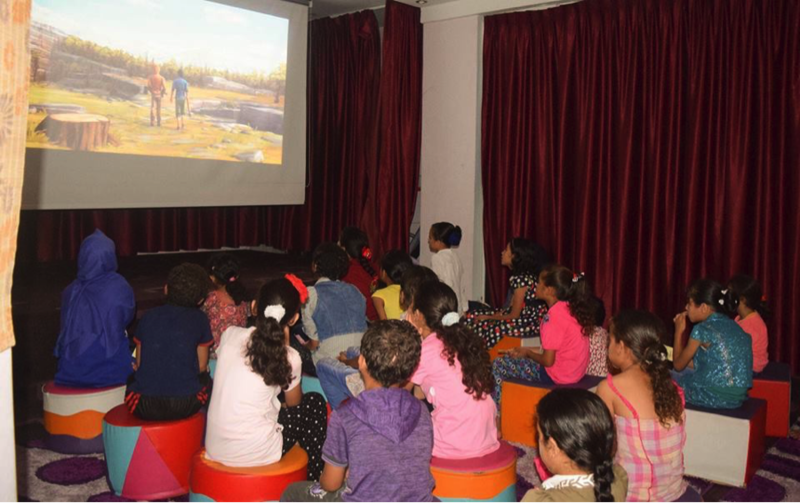 Gaza Children Cinema seeks to reach out to more children through providing spaces for fun, recreation and escapism through cinema. The current situation in Gaza is highly concerning. The violence children witness daily is negatively impacting entire generation emotionally and would take years to undo the impact of trauma and restore sense of hope for future. According to latest United Nations Independent Commission of Inquiry, Israeli occupation forces killed 34 children and 1642 sustained injuries from live ammunition in the context of “March of Return” between April-December 2018 in Gaza. We are excited to share some cinema related news from Gaza, Palestine. 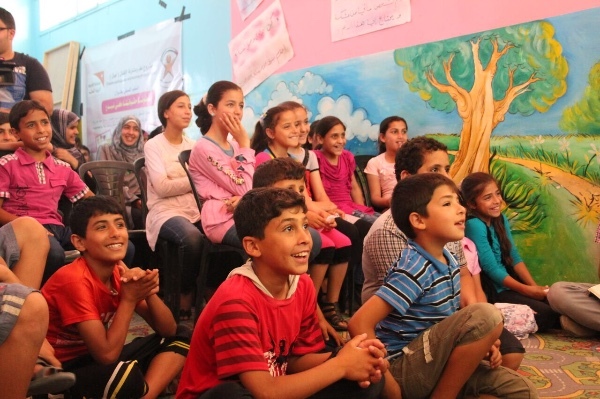 Gaza Children's Cinema team continues to deliver cinematic experiences for children across the Gaza Strip, Palestine. 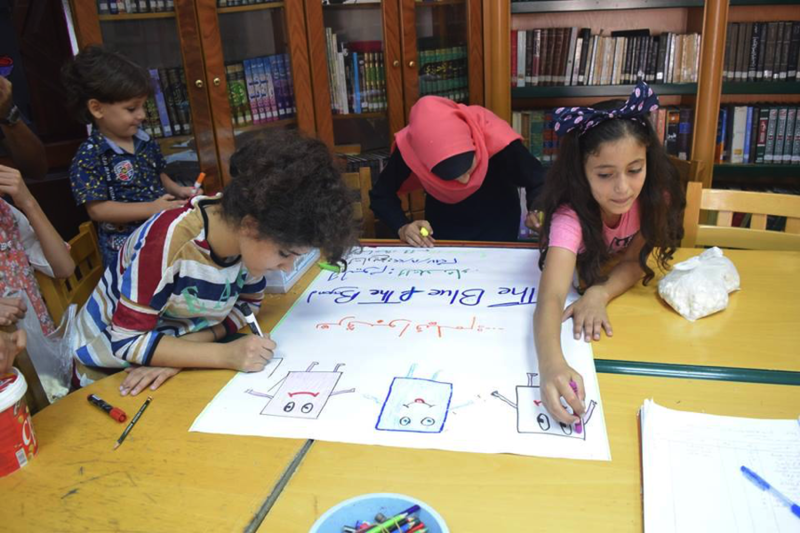 with the remarkable support of the initiative's partner Tamer Institute for Community Education, movie workshops and recreational cinema-related activities are being organised in five local education community libraries in Gaza. “Cinema has become a space used by children as an outlet to express what’s inside of them” Mais Sakka, Gaza Children Cinema field coordinator. 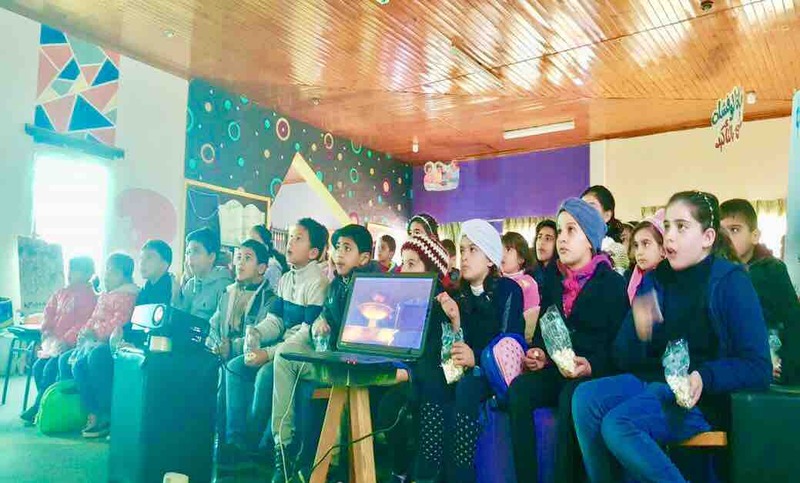 24 cinema workshops held in 5 local community libraries across the Gaza Strip with the participation of youth and children during January 2019. 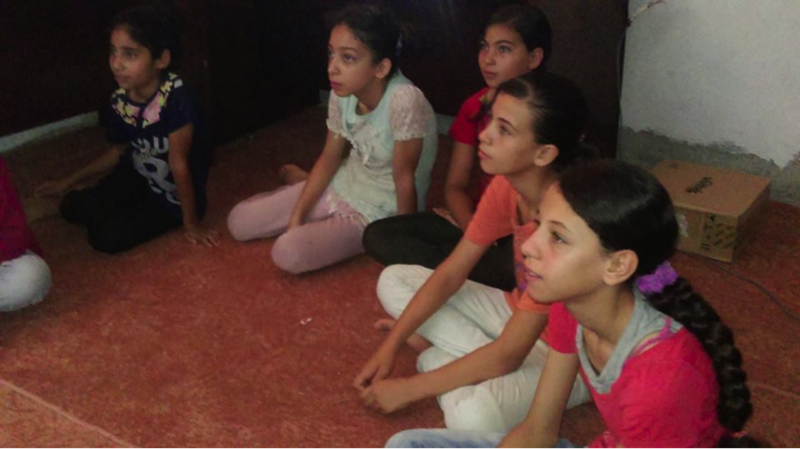 “Children attendance to cinema workshops in Rafah Municipality Library -south of Gaza Strip- has been remarkably noticeable. Librarians were surprised by the large number of children coming to library to attend the cinema workshops. Librarians had to split children into groups to accomodate all children. The beautiful interaction of children in film meetings and the open spaces which cinema offers have allowed childen to express their inside voices: some were wondering why cinema isn’t available in Gaza? What could be done for cinema to be reopened in the Gaza Strip?..... In addition to a large number of questions that sometimes cannot be answered”, Mais Sakka - Gaza Children Cinema filed coordinator reporting. 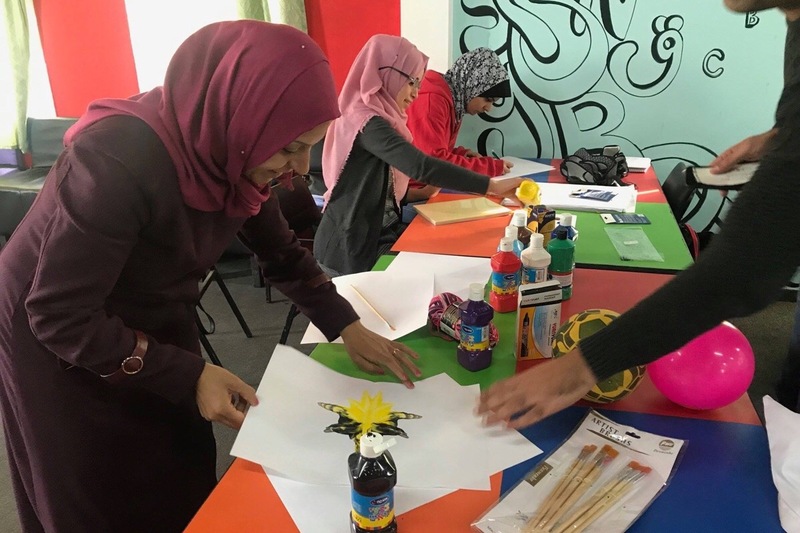 Gaza Children's Cinema with support our implementing partner Tamer Institute has completed a two-day training for educators/librarians who run the cinema activities across the #Gaza Strip. Local public libraries act as a vital force for local community development and empowerment. These local libraries serve as cultural and social environments. 15 educators and librarians participated in the interactive workshops which will host the movie shows for children, youth and families during 2019. We believe that investing in local community librarians is important. They are the voice of their local community members including children. Providing quality educational cinema workshops require improving the quality of training of librarians. 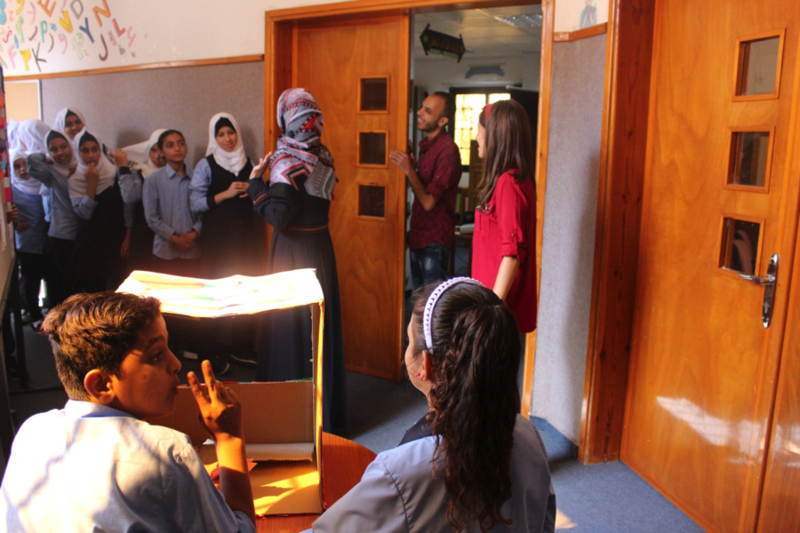 Gaza Children Cinema works toward building meaningful and inclusive collaborations with local community libraries, especially libraries in refugee camps and marginalized communities.